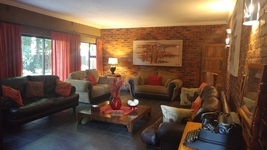 This 19 room guest house / hotel with its rustic brick interior and exterior is located in the leafy tranquil suburb of Beyerspark, Boksburg on the East Rand of Johannesburg, Gauteng. 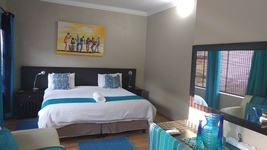 24 ON VREY pride itself in providing clean, safe, and spacious 3 star Guesthouse accommodation for the business and holiday traveller at affordable rates. 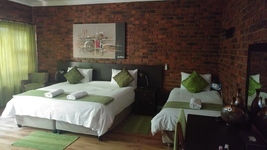 The Hotel accommodation provides in all the rooms extra-long beds with quality linen and air conditioning. 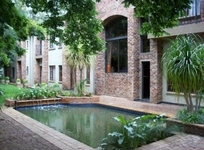 There is a standby generator and water tank to ensure our guests a relaxed and hassle free stay. 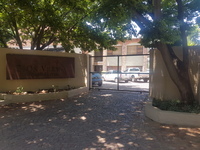 For the safety of our guests and their vehicles they are provided with a security remote to access the premises and access doors. We provide a full Breakfast. Dinner and Lunch-packs are available on request and must be pre booked.